When it comes to paranormal romance, the most important thing by far in my book is the characters and their chemistry. And boy, let me tell you, Beka and Marcus had that in spades. I absolutely loved the antagonism between the two of them. Of course, it does help that enemies to lovers is my favorite trope, all that yummy tension really makes the book for me, and trust me these two had it. I absolutely loved seeing these two dance around each other and throw their barbs back and forth, all the while getting closer to one another. Trust me, it was perfect. Moving along to the plot, it was pretty enjoyable as well. I like how these books mix mundane problems in with supernatural issues. I think it just makes things a bit more interesting to mix it up and raises the stakes a bit. Of course that the normal humans have no idea that their issue is also affecting the hidden supernaturals only makes it more interesting as some of their eyes get "opened." I also enjoyed how this plot set things up for the next book, making me really want to get my hands on it, and keeping me hooked. This was another fun romp, and just the thing I needed. It's no secret that my first love is Urban Fantasy. I just love the recurring main characters and the fantasy/paranormal aspects. However, they can be a bit frustrating in the romance department as that takes several books. So books like WICKEDLY WONDERFUL serve as the perfect and fun palate cleanser for me, this one particularly so. I really enjoy the world Deborah Blake has set up, especially in that it's not the same old tried and true paranormal characters but a great mix and Baba Yagas that aren't old crones to boot! 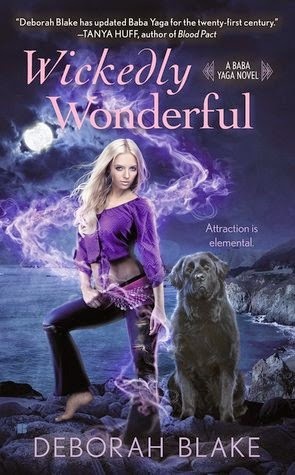 I really had a blast reading this book, and I think it's perfect for any paranormal romance fan who is looking to escape for a couple of hours.